6 Bed/6 Bath True Luxury Condo Combo Guests Call "Paradise" in "Ideal Location"
This 2 condo combination offers true luxury in what our guests have called the "ideal location" in Mammoth -- just steps to Canyon Lodge where you can hop on the lift to the top of the mountain or the gondola to The Village. But why would you want to leave when you can relax in your private hot tub while you watch the kids play in the back garden's snowy sled hill? With only 2 other units in the building, this complex provides all the conveniences of a condo (garage parking, storage, proximity to slopes, easy check in, maintenance and cleaning staff on call) with the private feel of a single-family home. This listing is for a two condo combination that together provide 6 bedrooms and 6 baths in almost 4000 square feet-- with private hot tub, sauna and three decks. These condos make up the entire top floor of Sonenalp, and are connected by both the expansive back balcony with private hot tub and sauna and an interior foyer. Each condo has a large open floor plan with plenty of plush seating for large groups. The fully stocked expansive kitchens boast granite countertops, custom cabinetry, and high-end appliances making it easy to cook a wonderful meal at home. Beds and baths are equally luxurious with high end furnishings and finishes. In unit #4, the large master bedroom features a comfortable king size bed, fireplace and a 40” flat screen tv. The master has an en suite bathroom with tub/shower and dual sinks. The 2nd bedroom has a king size bed and a 32” flat screen tv. The 3rd bedroom features a queen size bed. All bedrooms have luxury linens, ample storage and large closets. There are 2 other bathrooms (one with a tub and the other a shower only.) All bathrooms have top of the line fixtures and marble tiles. Condo #3's master bedroom has a California King bed, private fireplace, stunning views, new 37' flat screen SmartTV, a daybed and a private en suite bathroom. The master bath features double sinks and travertine tile. The 2nd master bedroom has a king bed and a new 37' flat screen tv with an adjacent bathroom--also with dual sinks but also a separate toilet/shower room. The 3rd bedroom has 2 sets of twin over full bunk beds and a 37' flat screen TV, xbox, small foosball/game table. All bedrooms have luxury down and natural fiber linens, ample storage and large closets. The third bathroom features a large walk-in, stone-tiled shower. All bathrooms have top of the line fixtures and natural stone tiles. We are also happy to help with arrangements for babysitting, gear rental/purchase, groceries, chef services, massage, etc. Don't hesitate to contact Mary Beth with any questions as you plan your stay. All our listings are pet-friendly, but we will need to approve your pet prior to booking. There is a $200 fee for approved pets. Need help deciding which condos are right for you? Don't hesitate to contact us for specialized help if finding the best fit for your group. These condos are owned by two SoCal families who love Mammoth for its idyllic weather, breath-taking beauty and unique vibe. We love to spend as much time at our homes in Mammoth as we can with our children and friends enjoying Mammoth's year-around sports, activities, festivals. And when we can't be there, we love having the opportunity to share our homes with you! In the summer we hike, bike, canoe and fish. We live for the winters, of course, when we take every opportunity to ski, board, sled and play hard. 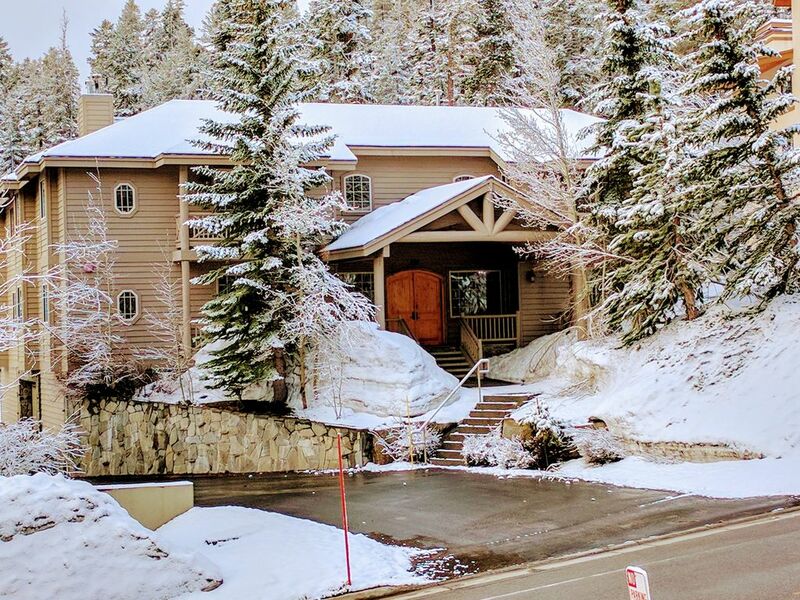 Both families had visited Mammoth for many years but as soon as we saw Sonenalp and its ideal location we knew these homes were perfect for us! For several years we searched for the perfect home away from home in Mammoth. After looking at countless properties we started to think we'd never find our dream home. But we lost our hearts to Sonenalp the first time we drove up to the wide front porch and warm wooden double doors. The location is ideal to discover all that Mammoth mountain has to offer with easy access to winter slopes & summer hikes and an easy downhill stroll to town. In addition to the great location, the condo was built with the utmost attention to detail. All materials, fixtures and appliances are top of the line. The gourmet kitchen is a chef's dream and the open floor plan is perfect for entertaining and socializing. We've updated the furnishings with high-end furniture and luxurious linens so that it lives like a home. Lastly, because the complex only houses 4 units in the building, this condo feels more like a single family residence than a condo. We know that you will enjoy our Mammoth home just as much as we do. Views from Sonenalp 3 to Lake Crowley; Views of the Sherwins from both condos as well as the back balcony and hot tub. 2 dining areas seat 20 total at tables and 8-10 at adjacent breakfast bars and nooks. Wonderful property for a big gathering and a great owner to work with. We stayed here with a group of 11 people and had a great time. The property and amenities are first class and the location is close to the slopes. Everyone was very impressed with the two units. We enjoyed the large kitchens, hot tub & sauna, and the ample parking in the garage for several vehicles. Would highly recommend these units! The owner was also a please to work with – thanks! David, thanks for being a chill and easy guest and for leaving us a great review. Love that you felt your stay was 'first class!" You're so right -- the parking is really generous for Mammoth and we feel lucky to have it! We loved hosting your group and welcome you back for another Adventure Refined stay! Very clean and nicely accommodated. There was a lot of snow. the crew kept the driveway clear. the underground parking was great. we all had a great time up there. Would like to rent again. Thanks for staying during snowpocalypse 2019. Our crew does go the extra mile... shoveling 10 feet of snow in one week is a challenge, for sure! Would welcome you back and will double our effort to give you the 5-star stay every guest deserves. Great condos, well appointed and cared for. The best we have found in Mammoth! Loved the place. We had 8 adults and 7 kids in the two upstairs units and loved them. Nicely furnished with great beds and ample kitchenware. Being able to walk to the lifts was great. Loved the jacuzzi generally had a great trip. Truly the best condos we have seen in Mammoth and having them so close to the lifts makes them an easy choice. Mary Beth reached out to us before the trip with her cell in case we needed anything and was very easy to contact by text. Very nice experience and would highly recommend. It's a beautiful house and well maintained. They prepared many things in the house. It makes you like staying at your own home. A five minute walk to Canyon Lodge (in ski boots!) where you can easily take a chair lift up to the top of the mountain. If you prefer you can hop on the gondola which will take you right to the village. You can also walk down to the village in about 15 minutes. Feeling lazy? Take the shuttle, right out front, that will also take you right down to the village or up to Canyon Lodge. Come to Mammoth for long ski seasons, November thru June with record breaking snow fall. Mammoth also offers amazing trails for all types of snow sports, or come for the Summer, for endless recreational opportunities like golf, hiking, biking, tennis, motorcycle trails, etc.